Conversational marketing is a famous concept used by many companies to narrow down or reduce their sales cycle and create a more interactive experience to their customers while buying. Unlike traditional marketing, conversational marketing utilizes the chatbot technology to create a more natural and human experience to the customer. They can gather information any time, instantaneously without delay in the response time. Using Conversational SMS you are not just reaching out to people only asking them to make purchases but also answering their questions and providing more information about your business. Customers are cluttered with various different companies and offerings for exactly the same product. The buying experience has changed and people want to make sure they have more information before they make a decision. Using conversational SMS customers have more information about the company and their products. SMS Marketing & Customer Engagement application by Voicy.AI has mastered the conversational marketing space by providing marketers the freedom to not just to run SMS Campaigns but also create interactions between the business and customer. The unique application has pre-built flows which can generate orders and also customizable for the various needs of marketers. Using conversational SMS is very simple, just ask the customers to reply with an associated keyword, number, etc. Once they reply the response is sent instantly. Conversational text messaging can save time by automating your customer service and engage your customers with relevant and professional conversations all the time. Start engaging with your customers now by using Voicy.AI’s SMS Marketing & Customer Engagement app. Regardless of the span of the business everybody began incorporating SMS Marketing in their marketing blend. Numerous organizations are utilizing SMS as an approach to connect with their customers when they are most likely to stop by your business. If you have not considered it yet, it is the time to reach out to all your customers. More than 2.5 Billion people have smartphones that are capable of text messaging. Latest statistics state that people tend to receive communication over a text message over any other source like talking over the phone, email, etc. Voicy.AI has developed a perfect solution for all your SMS needs using SMS Marketing & Customer Engagement application. Reach out to all your customers within seconds using Voicy.AI’s SMS Marketing & Customer Engagement App. Interact more with your customers and allow them to respond back to your messages quickly and easily. Text messaging almost provides results almost instantaneously. People tend to open their text messages with a few seconds or minutes. If you are not using text messaging as one of your marketing strategies, start using SMS Marketing & Customer Engagement and accelerate your brand loyalty and awareness. Voicy.AI offers SMS Marketing and Customer Engagement application beginning from 9.99$ per month. Black Friday is the day following to Thanksgiving and it has been the busiest shopping day since years in the United States. And Cyber Monday is celebrated on monday next to Thanksgiving. It is created in recent years to cater to the emerging online shopping experience. It is the time of the year where everything is on sale and shoppers rush out to stores to clear their wishlists. Marketing is a huge clutter during this time and people see offers and promotions all around and the email inbox is filled with promotional emails. Marketers struggle all their ways to ensure that people are aware of the offers and discounts offered by them. SMS Marketing is one of the fastest and most effective ways of communicating with an open rate of more than 96%. People are always with their mobile devices and most of them tend to notice their message notifications within a few minutes. Voicy.AI has perfected the SMS Marketing solution by making the SMS conversational and providing the option to customize the SMS Chatbot. Now customers can not only know about the promotion but also place an order directly with a simple reply by taking advantage of the unique order generation feature. Not just that, Customer service is being taken care off by providing information to the customers like timings of the store, location and all other general questions answered instantly. You can alert all your customers during this Black Friday and keep them loyal by providing them with exclusive coupons, shopping links and much more. 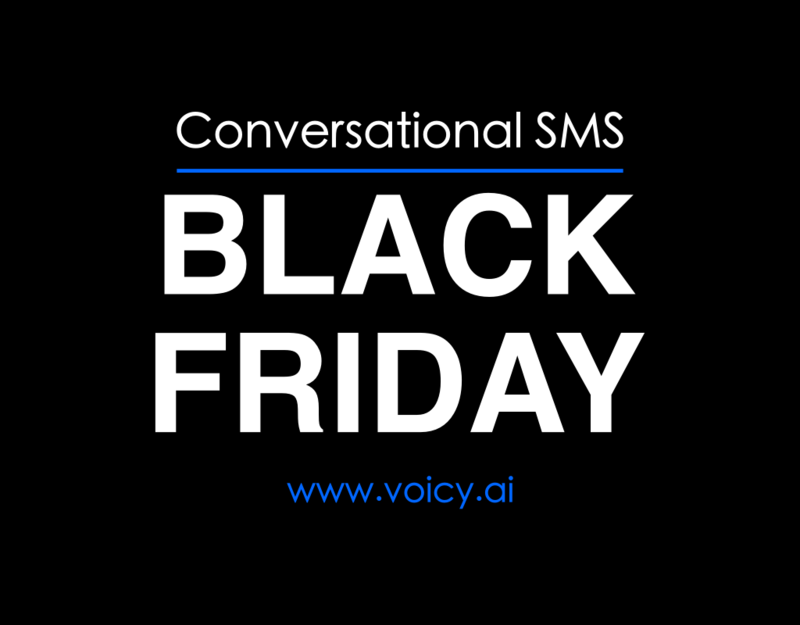 Start using SMS Marketing & Customer Engagement by Voicy.AI for your Black Friday promotions and standout in the clutter of deals and promotions. a) Apply a sequence to sequence model with attention on filtered SemEval dataset. b) Loop through each seed sentence and generate a semantically equivalent sequence to sequence model from step a.
c) Take generated sentences from step b and add it as a seed sentence and recursively apply step b till you get sentences which are not semantically similar as evaluated by say a Siamese Network. What are your thoughts? Can you please let me know the results, if anyone gets a chance to implement it? One of my customers visited the salon soon after Halloween last year and said “Hey, thanks for getting that perfect spooky look on my face last night. My colleagues were all surprised at the Halloween party we had and were enquiring about your saloon. One of them got so fantasized with the nail art you made. Well done!!”. She sat down with me and jotted these five ideas that will work well in promoting my salon. I started implementing these salon marketing ideas for every festival season and they earned me some whooping profits. I am going to use these extensively even for this Halloween and thought of sharing with others who want to promote their small-time salons. 1.Halloween face painting or nail art: One way to showcase your clients what your skills are is to offer free face paint or nail art service to all kids who go for Trick-or-treating in your town. Promote that parents can come in for any service at your salon and you will face painting for their kids for trick-or-treating. Run this throughout the month and give out the coupons for face painting or nail art that can be redeemed a day before or on the day of Halloween. 2.Organize a social media contest: You can organize a social media contest (for eg: #hashtag contest), with some interesting theme. Host this event for a day or two at your salon and you will get a good list of the customer base to promote your services. Don’t forget to decorate your salon in Halloween or any other theme and concentrate on your perfect look that matches the theme you chose. Plan this at least 15 days before Halloween. 3.SMS Marketing: Now that you have developed a base for your promotions, add some Halloween texture to your messages and spread them across that base. Marketing SMS is the easiest, fastest and cheapest way to spread the fire of your offer. I chose Voicy.AI as marketing SMS solution to spread the word and manage the responses and bookings. They made my life easy all throughout the season by their SMS marketing service. Unlike other SMS providers, Voicy.AI offers Two – Way SMS Marketing and their Quick Replies feature lets you automate your customer service needs and make unlimited customization to their SMS chatbot. 4.Group Vouchers exclusive for Halloween: You can distribute vouchers at cafeterias or small businesses, which offer a handful of services with attractive discounts to a group of 4 or 5 people. 5.Gift them when they visit you: Who on the earth doesn’t like to be treated well or gifted? Keep some gifts to give your customers when they visit your place. Make them customized with your Salon details in some corner (careful about this, you give them to use them) or buy some yummy treats. Keep some surprise vouchers, which makes them visit your place again. In the age of electronics and internet, make wiser choices to reach out to your target audience. I made a wise choice by reaching out to the right people via Voicy. The best part is, it could handle the responses and queries for bookings amazingly well and generate orders with its intellectual system. That’s how I increased my salon’s visibility through technology, more than by its geography. A major percent of internet advertising revenues are shared by Facebook and Google. Facebook makes it advertising money using re-targeting, and latent targeting on user profiles. Google uses an auction model built on search queries to fill its coffers. Search query is one of the top most actionable intents from the user on internet. Google has built an amazing business around it. Facebook has got more or less monopoly around social communication. Social tweets and messages don’t have a merchandising intent, similar to search queries. Facebook has trickily used the re-targeting mechanism (Disclaimer: I patented the idea, before anyone has implemented it) to make the ads more actionable. We will eventually be at a stage, where Facebook and Google will be fighting for the same ad dollars. Who has got a strategic advantage to win the war? In my view it will be Facebook. Elaborating more, Facebook controls the user’s interests and influences across its social properties. Facebook can use the personal data from the users to predict search queries and information that the user will “Google” in the near future and make it as part of the user stream. You might ask, is it possible? How can Facebook predict search queries before they happen? Facebook has got a search engine on its page and has got a partnership with Microsoft’s Bing. They have access to both what the user is doing at any given point of time, what their influences are and what their search queries will be through its popular properties and partners. They also have significant information on a user through their re-targeting program, about their activities outside of the social walls. Using above data, one can use variations of Sequence to Sequence algorithms to give search queries. The input sequence can be the aggregated behavior. We can use social profile embeddings, image embeddings in the social stream, previous search queries, the location information as inputs for the Sequence to Sequence algorithm. We can us a Variational encoder for representing the input data. The output sequence can be a list of search queries that the user will type on Google. One can also pose the query prediction as a recommendation problem. We can train a wide and deep neural net on the user’s data and search queries to predict search queries. We can also borrow techniques from Zero Query search engine techniques to do the predictions and generate information in Social Streams, so that users don’t have to go to Google to get information. It would be a great win for users and Facebook, if they can stop the interruption on social browsing by 50%. Facebook can make money by asking the advertisers to bid on predicted search queries. It might be an easy sell, to the advertisers, with their relationships and engagement numbers. If I were Google, I would be really scared of this possibility and eventuality (Most probably in the next two years). I would break the Facebook’s monopoly on communication as early as possible. Disclaimer: My friends at Facebook and other social networks, if you decide to implement this idea, I would appreciate, if you can pay me royalty for the patent I filed with title “Advanced techniques to improve content presentation experiences for Businesses and Users”. Please don’t ignore legal notices from a poor innovator :). Visit us at www.voicy.ai for more information. The ex-CEO’s quote from the 1970’s is still applicable to the airline industry of today. According to the International Air Transport Association (IATA) the global Airline industry has doubled its revenues from US$369 billion in 2004 to a projected $746 billion in 2014 but making stable and consistent profits still remains elusive. Increase in competitiveness, customer expectations, fuel expenses, low cost carriers, labour unrest are some of the major issues challenging the airline industry . For example fuel accounts for almost 20% of a carrier’s cost structure and the fuel prices are expected to increase to $64.9/barrel ( which is a 25% increase compared to the current cost/barrel) over the next year, which is significantly going to affect the profits made by the airline industry. Correspondingly, with the constant fluctuations in the traditional passenger traffic, airlines will be scrambling to fill the unused capacity – a variable that drastically increases the operating costs per trip. It is no wonder that when thrown in an omni-present hyper-competitive environment that constantly drives price wars, the executives always look for ways to reduce costs and drive additional revenues. This is exactly what is happening with the Airline industry. Out of all the ways that can help improve revenue, Customer service could be the one touch-point of airline operations to improve their revenues. There is enough proof that customers are willing to pay the extra penny for a good service. Be it targeted marketing, new reservations or post-reservation services; customer experience is the next battleground for the airlines looking to differentiate themselves. A detailed primary research (lots of reading and talking to other airline travelers), it was established that 73% of airline travelers agree that the customer service experience with most of the airlines is dissatisfactory and time-consuming. Increase in the no.of air travelers, insufficient customer service personnel, language barriers have also been contributing significantly to this attitude in the customers of the airline industry. This shows that, despite their continued efforts of making labor-intensive customer service investments, the airlines are unable to produce the results needed to improve their ROI. Voicy from Voicemonk brings you an AI-enabled virtual agent that can be your customer engagement personnel letting you to completely automate the process of customer service to all your customers. Being a natural dialogue platform, Voicy enables your customers to converse with it, while retaining the context of earlier conversations ensuring customer satisfaction. But how does this benefit airlines in terms of numbers? The airline industry has an average passenger load factor of 80%. An AI-enabled chatbot solution with awareness of passenger context through multiple channels (Facebook, Slack, Telephone or SMS) can facilitate conversational commerce translating into just-in-time bookings. We anticipate this improves utilization upto 84% resulting in an additional $0.72 profits per passenger, representing a 16% increase from the current industry average. Approximately 5% of airline revenue is spent on customer servicing costs. On an annual basis, that is approximately $30 per passenger. Trials with Voicy for Airline indicate that this service cost can potentially fall to $24 per passenger, resulting in $120M savings annually, a non-trivial amount in an industry with only 4.1% net profit margin. A recent study by SH&E, a leading aviation consultancy estimated that as a percentage of revenues, the latter activities’ share ranges from >10% for a carriers such as British Airways to ~3% for LCC’s such as Ryan Air. This means it costs most carriers approximately $30 to acquire and book new customers as opposed to $10 for LCC’s. Voicy.AI with its contextual/historical awareness and tight integration with backend ecommerce, payment, CRM, marketing platform could enable most carriers to reduce this cost to approximately $26/passenger over 2 years. In the service and hospitality industries one thing that’s keeping small business owners awake at night is customer experience (CX). CX is critical because it holds the key to a customer’s willingness to spend money with you now and in the future. According to a Walker study, by 2020, customer experience will be the most important thing that differentiates your brand, outgunning both price and product. And a customer’s experience with your brand starts way before they hand over payment for a take-out or receive a beauty treatment. It starts with the impression they get from trying to make a booking via an app or your website, or the ease with which they get information when calling your store, or how quickly they get a response to an enquiry. Customers are becoming ever more demanding. They expect the same – if not better – experience from a small business as they would from a well-resourced multinational. But they want it ‘their way’; mobile app consumption has hit a plateau as customers adopt chat as their new browser. By 2019, requests for customer support through mobile messaging apps will exceed requests coming through traditional social media. And data shows that by 2018, “buy” buttons will contribute 2% of brands’ digital sales. This may sound like a small amount, but it represents billions of dollars worth of business. And that’s the conundrum: for a small business, providing an amazing omni-channel experience for customers could be a differentiator for your brand but getting it right could take time and money. You might need to invest more in your digital channels to respond quickly to customer requests. And what small business owner can afford to do that if it risks taking resources away from delivering a service to customers? Here’s where technology can play a part. Small service-driven businesses like restaurants, take-away outlets or beauty salons could benefit hugely from the development of artificial intelligence. Imagine you own a beauty clinic in Texas with an ambition to grow. But investing in digital capabilities, promotions and hiring people to handle bookings and customer enquiries is expensive. If people are not dedicated to these tasks, you’ll miss out on bookings altogether. So what if you implemented an artificial intelligence agent to take bookings and handle customer responses to specific promotions? This may sound like science fiction, but it’s a scenario that we’re making real with Voicy.ai today. That Texan beauty clinic I was talking about is actually one of our clients. We implemented an SMS promotion which went out to 7000 customers on their database, offering them a reduced-rate beauty treatment. An automated ‘bot’ or virtual agent handled customer responses and we programmed it to answer the top 20 expected questions either on the phone or via digital channels like Facebook Messenger. Because the technology is integrated with the customer’s booking and point of sale system, the virtual agent can automatically take appointment requests and book them in. And working with the client, we’re able to continually grow the intelligence of the service by adding answers to new questions we hear from customers. This means the system gets even smarter over time, so the amount of merchant-to-customer interaction required continually decreases. So by implementing a virtual agent, this business has been able to focus resources on the customer experience in their clinic. They’ve also implemented manageable promotions to drive repeat business at a higher margin than previous promotions have delivered, in a way that allows them to comfortably manage the ebbs and flows of demand. And this is critical because repeat business, referrals and recommendations deliver more profitable, long term value than something like a Groupon promotion could ever achieve. AI agents cost less to implement than people and of course this raises a few questions. Firstly, some clients fear that customers may not like dealing with a bot and would prefer to speak to a real person when making a booking. Whilst that could be true in some demographics, it’s definitely changing as customers get used to using automated services even in mission critical activities like personal banking. Gartner predicts that by 2020 customers will experience 85% of all service interactions without communicating with a person because bots can help you 24/7. Secondly people fear that AI will take jobs away. Gartner research states that by 2025, up to one third of all jobs could be replaced by smart machines. But whilst AI will reduce the number of repetitive tasks done by people, it will enable business growth and investment into other roles. AI has the power to democratize customer experience, so that even SMBs can afford dedicated support which pays for itself by delivering business growth. The benefits to customers are clear: using Voicy.ai, SMB customers are increasing their revenues by at least 15%, whilst also reducing customer engagement costs by up to 70% and improving overall customer satisfaction. Those are huge wins. And in the case of our client in Texas, this means they can invest in additional beauty technicians to handle their business growth. Getting CX right is critical, and mobile is becoming the most important part of an omni-channel strategy. Customers expect to be able to search for information, receive promotions, chat with agents and make bookings, all from their smart phones. Our voicy.ai platform provides multi-channel customer engagement over phone, SMS, messaging platforms like Facebook Messenger, voice assistants like Amazon Alexa, and multi-modal apps that enable voice and text interactions. So what are you waiting for? It’s time to implement AI today.